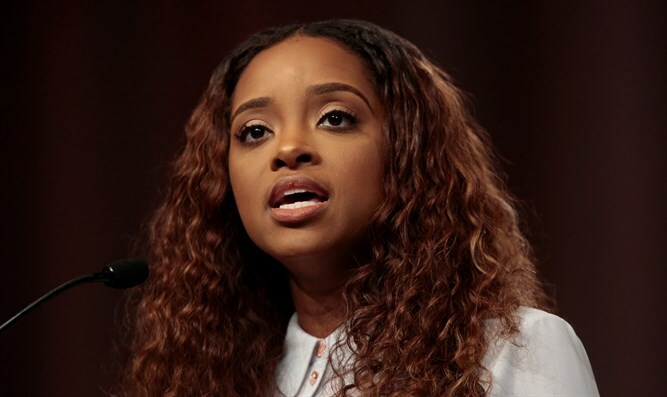 Women's March leader Tamika Mallory confronted on The View over support for Louis Farrakhan, refuses to condemn his anti-Semitism. In a tense exchange on “The View,” co-host Meghan McCain confronted Tamika Mallory about her support of Louis Farrakhan, the Nation of Islam leader known for his history of virulent anti-Semitic comments. Mallory’s response is sure to add fuel to accusations that she is too soft on Farrakhan and has not sufficiently condemned anti-Semitism. “I don’t agree with many of Minister Farrakhan’s statements,” Mallory said in the exchange. “Specifically about Jewish people?” McCain asked. “As I said, I don’t agree with many of Minister Farrakhan’s statements,” Mallory responded. “I don’t agree with these statements …” Mallory said. “You won’t condemn it,” McCain interjected. “No, no, to be very clear, it’s not my language, it’s not the way that I speak,” Mallory responded. Co-host Sunny Hostin had previously asked Mallory about her labeling of Farrakhan as the GOAT, an acronym for the “greatest of all time,” in a Facebook post from 2017. “I didn’t call him the greatest of all time because of his rhetoric, I called him the greatest of all time because of what he’s done in black communities,” she said to audience applause. Bland went further, saying the Women’s March unequivocally condemns anti-Semitism. When McCain asked if she specifically condemns Farrakhan’s remarks about Jews, she said yes — something Mallory failed to do at any point in the interview.